The Paul Lange Annual Fund is named in honor of the first principal of the first Lutheran High School in St. Louis. Lutheran High School opened August 26, 1946, at Lake and Waterman in the west central area of St. Louis. Dr. Lange opened the school with 248 freshmen and sophomores. He had a staff of 11 teachers and a budget of $80,000. The school achieved accreditation status before it graduated the first class, the first school in Missouri to achieve that recognition so quickly. Dr. Lange remained the principal until 1957 when Lutheran South opened its doors. At that time a new principal was called for Lutheran South and Lutheran High School became Lutheran Central, also with a new principal. Dr. Lange was appointed as superintendent of the two high schools. He served in this position until 1962, when he accepted a call to Valparaiso University as education department chairperson. He remained in this position until his retirement. Dr. Lange went to be with his Savior in 2003. 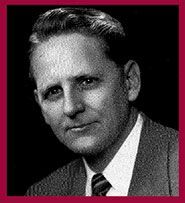 Dr. Lange was a distinguished leader in Lutheran secondary education. He was very active in the national organization Association for Lutheran Secondary Schools (ALSS). He was often referred to as “Mr. Lutheran High School.” He was the leader in establishing a partnership with Valparaiso and the ALSS. In 1994 in honor of the many years of service and leadership in the Lutheran high school movement across the nation, the Paul Lange Award was established by the ALSS. This award is given annually to a Lutheran high school administrator that exemplifies an extraordinary commitment to Lutheran high school ministry. Dr. Lange devoted his personal and professional life to Lutheran secondary education. Few individuals have so profoundly influenced the growth and spread of Lutheran high schools and inspired generations of Lutheran high school administrators.